I was on a Facecbook thread with a group of local mamas who were going to take Micah’s little buddies to NYC’s iconic Radio City Music Hall show, “Christmas Spectacular.” I hadn’t even thought about it since Micah wasn’t turning three until the end of November. Live a little: I could arrange to take him alone so that I can have rare one-on-one time with him while Daddy and Ellis bond at home. A special date. It would be one special memory. He would love a musical. The theater would be so cool. And going on the subway is always a big treat for him. And you never know…maybe we won’t even be here next year so we should go while we can. After going back and forth, I purchased the tickets. None of us mamas could work out our schedules to go together so we were each going separately on one-on-one dates with our firstborns. I told Micah about it the week prior to attending to get the anticipation going. After all, sometimes anticipation is more exciting than the real thing. After collecting him from school, I wonder if I should take the stroller into Manhattan. Hmmm…great for emergencies like if he insists I carry him but such a pain. Direct ride into Rockefeller Center, minimal walking. As always, he enjoyed the ride so much. Pointing out people’s shoes, “I like that one Mommy! We have that one at ho-ome!” Looking all around and telling stories. Hugging me, strumming my side fatty fats with his little hands, and laughing with his hand over his mouth like a cartoon critter. He enjoyed himself TOO much at the underground concourse level of Rock Center. He would not hold my hand as he ran around among the bustling lunch crowd. Oh, Lord, help me. He was so small in the crowd but he did not have a care in the world while I feared losing him. “MICAH! You HAVE to hold my hand!” I was carrying a mess of bags as usual, all our winter gear, sippy cup, and snacks. He slowed down when he looked like he had seen the pearly gates of heaven. It was a store called GameStop. 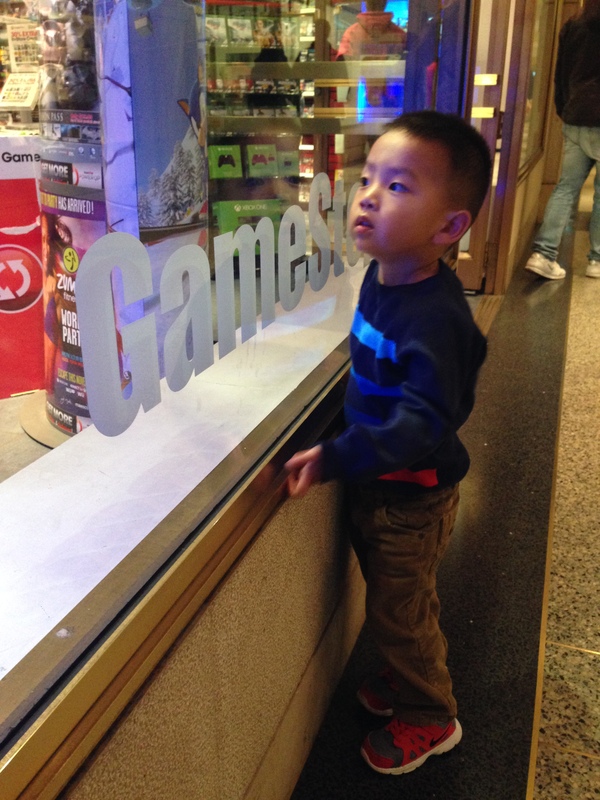 He pressed his face and hands against the store window, completely mesmerized, “Mommy, I want to go in there. I want to play that one,” about the huge video game display. We get through a very short line. We look around the gorgeous lobby. He refuses to go near Santa who is awaiting little boys and girls on the floor below. He would like to visit the candy bins instead. I wasn’t planning to buy him any overpriced candy but hey, it’s a special occasion and he looks really excited so I let him scoop out some gummy candies and end up paying $10.98 for a handful in a cellophane bag. $10.98. We squeeze ourselves onto an elevator to get to our seats. One lady in the back yells, “Hey, you, the person who just got on. Get off!” I want to shout back at her some choice expletives, including a lecture on entitlement but then I remember I am on a date with my boy, so I play the part of a mature adult and declare, “Sorry, I am with my toddler and we need a few minutes to settle in before the show so we needed to squeeze in.” It wasn’t even as crowded as some NYC elevators get. I think I was too nice (why did I apologize?) to that spoiled lady but I digress. We get seated. I’m relieved that I can still see everything clearly from my seats even with my eye issues which made me have to wear glasses all month. I look over at his little face sitting in the theater. This was really special to be on a real date with my firstborn. 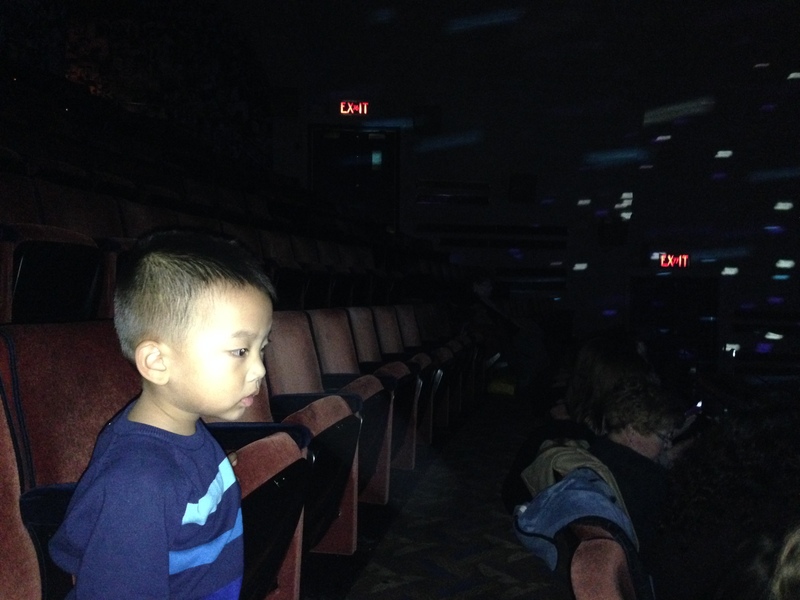 Look at that little face, entranced by this beautiful theater. What a memory. In fact, hmm…his face looks downright frozen with anticipation. Show starts. Booming intro music. Aww yeah, great acoustics. Sound of a baby wailing hysterically. Not a baby but maybe a toddler. I turn to see Micah horrified and bawling uncontrollably. I scoop him up and run out the theater. I sit down on the floor right outside the theater, rocking him back and forth. “Mommmyyyyyyy! Too dark! Too loud. I want to go on train and go to my home!” He is still bawling. Some tourists are getting escorted to their seats and look over at me consoling Micah. One of the ushers is trying to help us out. NO REFUNDS? Micah, sorry bro, we staying. The usher takes us into the nosebleediest corner back seats of the entire theater with some dim lights on the ceiling. “Micah, how’s this? See there are some lights up here?” Few seconds pause. Booming sounds. Theater gets darker again. We rush back out of the theater. Micah is still crying. I’m thinking about joining him. The usher held him in his arms like a long lost son while I went back in to retrieve our things. “Mommy!? Remember when I was crying so much?” Is this guy for real? Yes, I remember! BECAUSE IT HAPPENED 0.8 minutes ago, son! We make another attempt to go back into the theater with the usher’s guidance. We see multiple Santas dancing (creepy, I have to admit) in the pitch black theater with small spotlights on them and Micah starts crying again so I immediately run out, carrying him, perhaps for the fifth time. I feel like crying too. From weariness. From beating myself up for not listening to my gut. My glasses fog up. It was such a cold day and he was already a handful to chase even before the show had started. 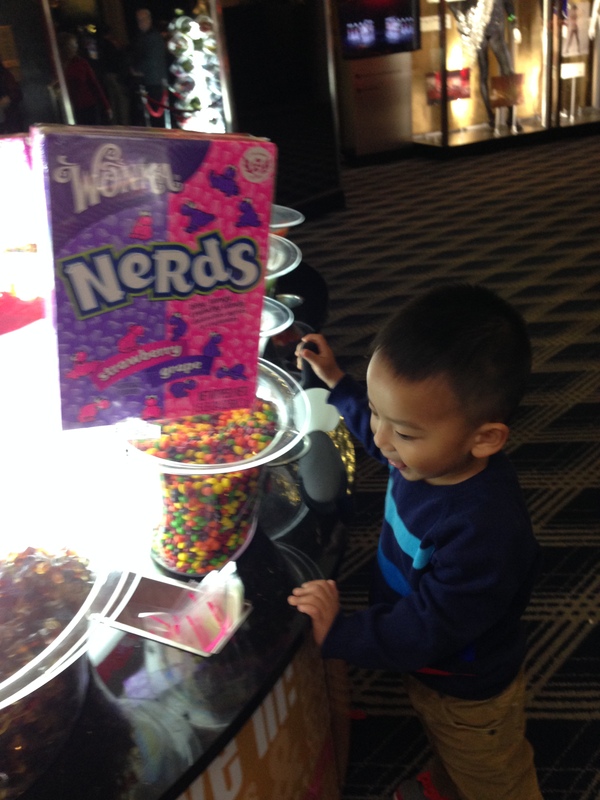 I had NO IDEA he would get scared at the theater since he’s been to puppet shows and other shows in dark theaters! It went on like that for a few more segments. In and out, in and out. 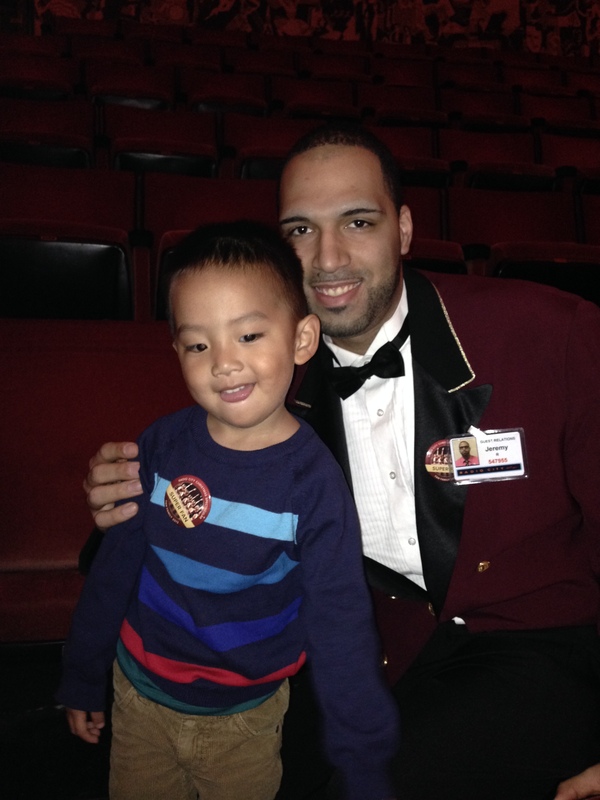 A nice young usher helped us out a lot by telling us which segments may be less scary. He even gave Micah a “Superfan” pin to pin on his sweater. Ohhhh, the irony. Superfan!? I thanked him profusely and took a picture of him and Micah after the show since we were practically family after that ordeal. Micah was able to enjoy the nativity scene. “Mommy, camel!” and some of the fake snow. When we were leaving, Micah was back to himself, even stopping to dance and ham it up. I was taking deep breaths but relieved that we caught more than 60% of the show, and that Micah was able to be persuaded to give scary things a chance. I had forgotten how small and young he still is. Because he’s become so Little Man-like with the things he says these days, I was treating him like I was at a movie with a peer, practically asking him how he’s liking the latest developments on “Scandal.” Just when I treat him like he’s grown, he reminds me again that he is still a young tender who needs his Mommy. 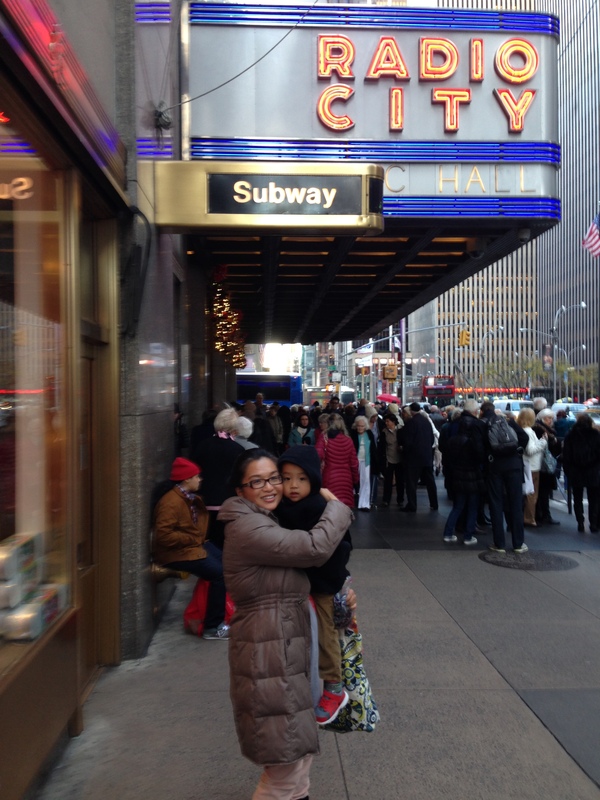 Apparently, we had become one of the attractions on the behind-the-scenes Radio City Music Hall tours. Of course, I feel all defensive and want to explain, “He’s been to the circus and planetarium before and he was fine, I swear. It was a total surprise he got so scared,” but I have some sense. I’m sure the senior citizens from Nebraska weren’t interested in hearing about his developmental phases. P.S. The hardest (and coldest) part of that day hadn’t happened yet. Remember how I left that stroller in the car? I hope to continue in another post but it may have surpassed my public urination day in suckiness, though I suppose it could be a toss up. Christmas Spectacular. Special memories, indeedy. 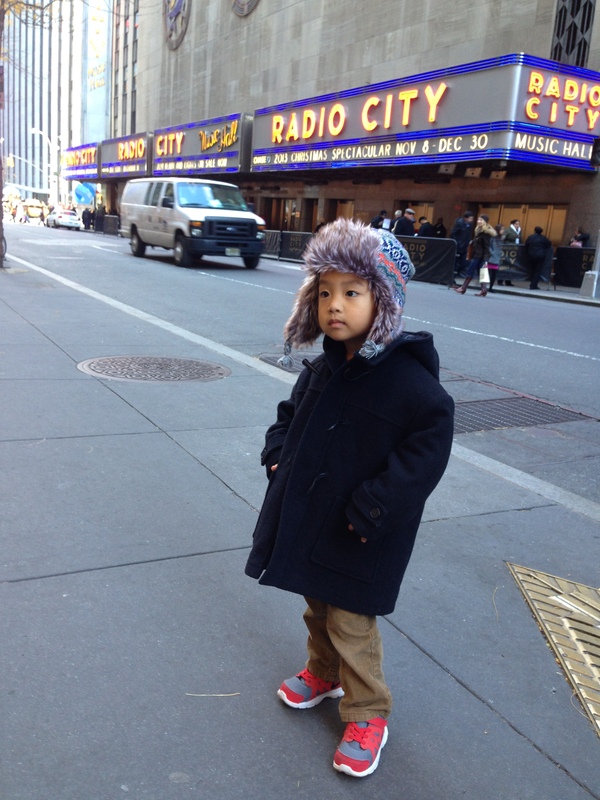 This entry was posted in from the parenting trenches, holidays, milestones, mommy, you so funny!, these are the days of our lives and tagged Christmas Spectacular, NYC Christmas, Radio City Music Hall, toddler fears, toddler meltdown by ajummama. Bookmark the permalink. Yay for Mr. Jeremy. And I’m glad you got to see a good portion of the show. I’m sure those tickets weren’t cheap. thanks for reading! yeah, tickets plus that handful of candy for $11 haha! mo’ money, mo’ money, mo’ money! we blessed enough to have been able to go. good lookin’ out, groupon! Impressed you stuck with it… For an entire show! Way to go! I think I would have wimped out and spoiled him.